Hello all! I was going through my stamp sets the other day (I was organizing and cleaning my craft corner) and came across one I’ve had for a few years from WPlus9. Its one of 2 sets that I own from this company and really love (the other one is a holiday set). 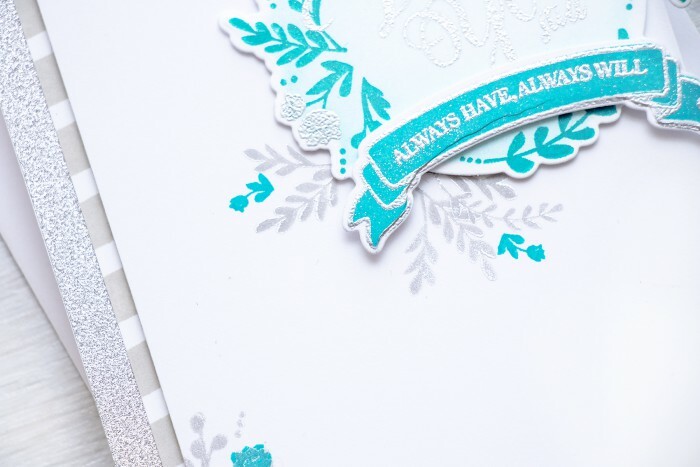 I was feeling inspired and wanted to try a new color combo – aqua and silver so I broke out my stamps, a few inks and embossing powder and created this card. 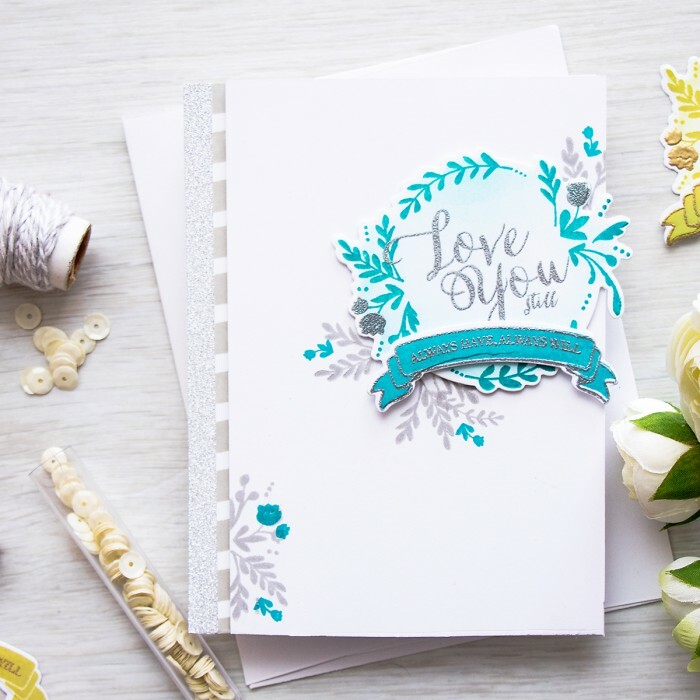 I started by making the die cut element – the floral piece and the banner. 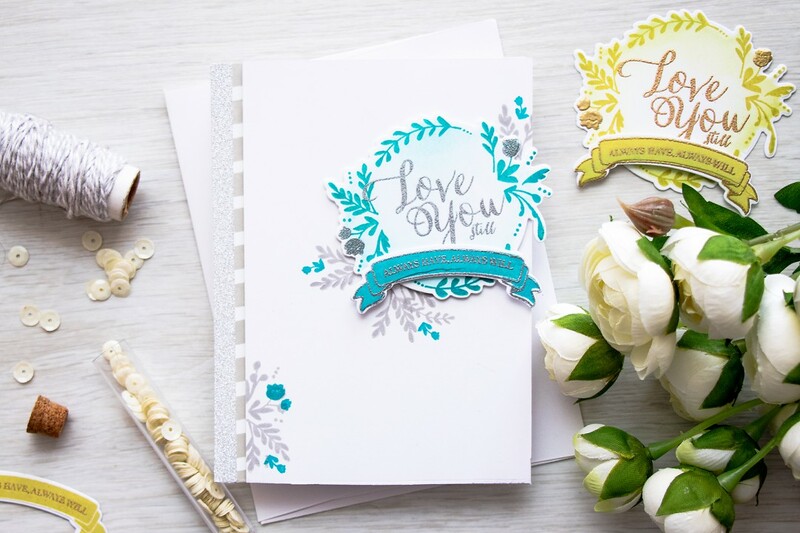 Both were stamped using SSS High Dive Ink and than heat embossed using Silver Embossing Powder from Hero Arts (I heat embossed the sentiment as well as the little florals and the banner outline). These were die cut using matching dies from WPlus9. I wanted to have some stamping done on my background panel so I used Silver Delicata Ink (its a gorgeous truly silver shimmery ink) and stamped several branches and florals. I could have heat embossed those using the same silver embossing powder, but I wanted a softer silver, almost grey color on the background. 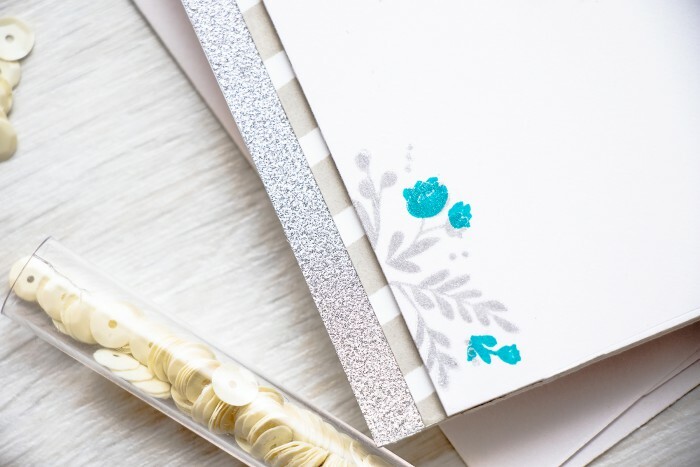 I did some stamp surgery and cut the smallest wreath apart – I wanted to have another small flower stamp to be able to add to my background stamping. So I stamped it several times using High Dive ink. The striped pattern to the left of my background panel was created using SSS Stone Ink and the banner stamp from the same Valentine Wishes set. I stamped partial banners repeatedly and than trimmed a narrow strip to use on my card. I could have used Simon’s Wide Background Stamp for that or ink blended the stripes, but I challenged myself to only use the Valentine Wishes set for this card and make the most of it. Since I already had lots of silver I also added a strip of Silver Glitter paper to the left. 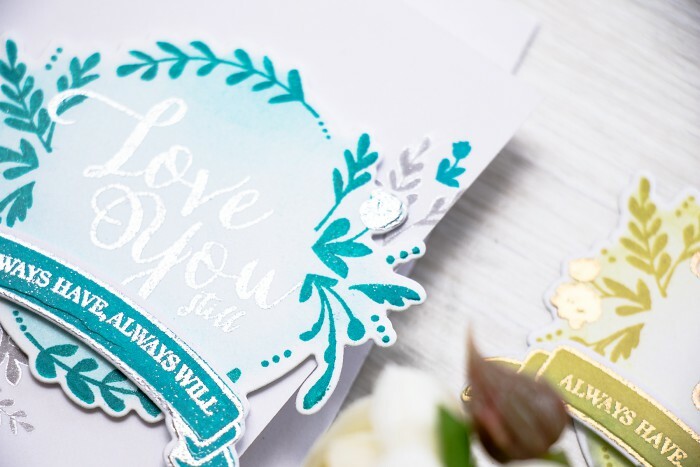 This is self adhesive paper (almost like vinyl) from Tim Holtz, its very smooth, even velvet-like to touch and glitter doesn’t come off at all. I also did some masking or stenciling and ink blending here. Once I cut the floral wreath out I kept the die in place and gently blended same High Dive ink to give this die cut some color. When I first started working on this card I used greens instead of blues. 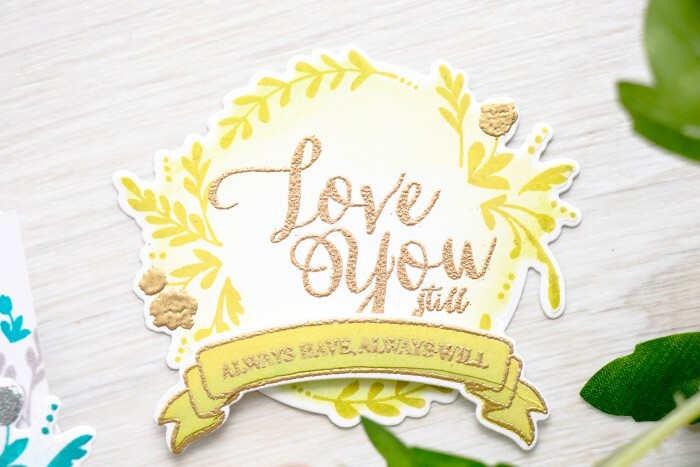 I made the die cut element you see below – combined Catkin Ink from SSS and Brass Embossing Powder from Hero Arts. This didn’t work for my card, but I still wanted to share it here since I think its a nice color combination. I am saving this piece and hoping to use it in the future. Yana, I was wondering how you like the EZ Runner Grand. It has so much more adhesive on it than Tombow Mono being 50 yeards rather than 39 feet. I have an ATG but I don’t like it. we have a love-hate relationship. Its a good strong adhesive, but I did have one re fill malfunction in a way, the tape wasn’t rolling properly, I was able to fix it. I do love it and use it all the time. That sounds like me and Copic Markers. I don’t love to use them and will pick an image I can watercolor every time I can. Great cards. Copics shouldn’t bleed if you use Copic friendly paper like Neenah Solar White. I never have a problem with bleeding and I color with Copics all the time because my watercolor skills are not so great. You might want to give a different paper a try. I have this set as well. Ànd believe only made one card with it. It definitely deserves more uses. Amazing wreath and fonts. Very beautiful card. Elegant and clean!